Published Dec 16, 2015 by Addison-Wesley Professional. Part of the LiveLessons series. Docker Orchestration and Microservices LiveLessons provides developers with key insights and best practices for how to develop and orchestrate containerized microservices. 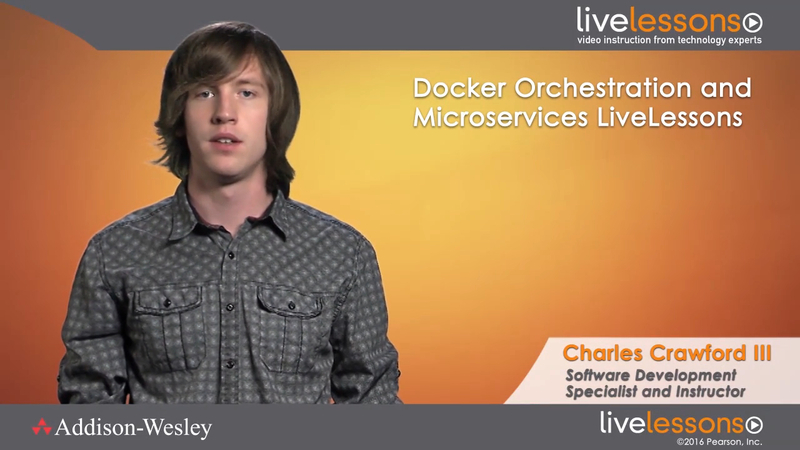 In this video training, Charlie Crawford starts by introducing some of the motivations behind microservices and how to properly containerize web applications using Docker. He then does a quick overview of how Docker registries can help to store artifacts from your built images. Following this, he walks you through Docker's latest tools: docker-compose, docker-machine, and docker-swarm. Specifically, Charlie covers how to use these tools to aid in both developing and deploying to a wide variety of system and container configurations. He then turns to Kubernetes, the popular container orchestration system created by Google. After watching this video, developers will have a strong understanding of modern containerized applications and microservices and will understand how these systems can benefit them. Lesson 1, “Understand Microservices,” covers the basics of what a microservice is, what problems it solves, and new challenges micoservices bring. Also discussed is how Docker fits into microservices and how it can be a great help in developing microservice-based systems. Lesson 2, “Dockerizing your Microservices,” looks at creating a basic microservice using Node.js. Next, this lesson covers how to create a Docker image containing the microservice and its dependencies. Lesson 3, “Using Registries to Store and Distribute Docker,” looks at using the Docker Hub service as a repository to store your custom docker images. Additionally covered is how to trigger automatic rebuilds of Docker images upon a code push to Github. Lesson 4, “Deploying Single Instance Single Container Apps with Docker Machine,” covers doing basic dockerized app deployments using Docker Machine. This sets the foundation for work in future lessons with Docker Compose and Docker swarm. Lesson 5, “Local Development of Microservices-Based Apps with Docker Compose,” explores how Docker is not only useful in a production environment, but a development one as well. One of the largest challenges of microservices is the more complex setup required for a development environment; however, Docker Compose makes local development easier than ever. Lesson 6, “Deploying Single Instance Multi-Container Apps with Docker Compose and Docker Machine,” is about extending Docker Compose beyond development environments to do multi-container apps on a single instance, quickly and easily. Lesson 7, “Multi-Instance Multi-Container Applications with Docker Swarm,” is where we take our first look at complex multi-instance and multi-container deployments. Docker Swarm is built on the Docker API, so a lot of knowledge carries over from vanilla Docker, but there are still additional swarm constructs to learn, such as the master and slave node systems. Lesson 8, “Advanced Docker Swarm Configuration,” takes a deeper look into Docker Swarm and teaches you about advanced configuration options such as container affinities. Lesson 9, “Container Orchestration with Kubernetes,” looks at Kubernetes, which takes a different approach to orchestration than Swarm. Kubernetes brings in many new concepts such as pods, replication controllers, services, and more. The LiveLessons Video Training series publishes hundreds of hands-on, expert-led video tutorials covering a wide selection of technology topics designed to teach you the skills you need to succeed. This professional and personal technology video series features world-leading author instructors published by your trusted technology brands: Addison-Wesley, Cisco Press, IBM Press, Pearson IT Certification, Prentice Hall, Sams, and Que. Topics include IT Certification, Programming, Web Development, Mobile Development, Home and Office Technologies, Business and Management, and more. View all LiveLessons on InformIT at: http://www.informit.com/livelessons.